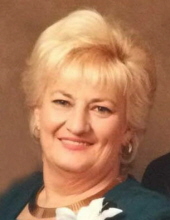 Patricia (Patty) Ann ‘Riley’ McClendon, age 76, of Clinton, MO, died on March 15, 2019, at St. Luke’s East Hospital, Lee’s Summit, MO. Patty was born to Edwin and Gladys Riley on February 7, 1943, in North Kansas City, MO. Patty married John R. McClendon on June 22, 1962, in Kansas City, MO. Patty is survived by her daughters, RaeLynn (Ben) Gochnauer, Lee’s Summit, MO, and Tracy Ann Bean, Clinton, MO; son, John Edwin (Kami) McClendon, Clinton, MO; grandchildren, Kelsey, Brittni, Alexis, Patricia, Katelyn and Hailey; great-grandchildren, Chloe, Mercedes, Nolan and Noah; her sisters, Barbara Riley and JoAnn Elio; friends, Elmer and Jackie Lewman; nieces, nephews, and other friends and family. Patty’s favorite pastime was working in the yard tending to her plants and flowers. She also loved decorating for most holidays and had a wide collection of decor. Patty was preceded in death by her parents and husband, John. A graveside service is scheduled for Thursday, March 21, 2019 at 2:00 PM at Englewood Cemetery. Memorial contributions can be made to C.A.R.E. (Clinton Animal Rescue Endeavor) and left in care of Consalus Funeral Home, 209 S. 2nd, Clinton, MO 64735. To send flowers or a remembrance gift to the family of Patricia Ann McClendon, please visit our Tribute Store. "Email Address" would like to share the life celebration of Patricia Ann McClendon. Click on the "link" to go to share a favorite memory or leave a condolence message for the family.